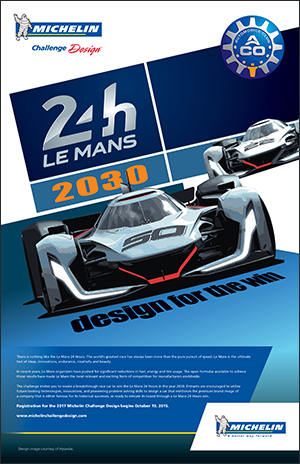 “Through our collaboration with the Automobile Club de l’Ouest, we want to provide an opportunity for those who become aware of the program around the 2016 Le Mans 24 Hour race, June 18-19, to enter the Le Mans 2030: Design for the Win competition,” said Thom Roach, Vice President OE Marketing, Michelin North America. Extending the deadline for entries until August 1 provides additional time for students, designers, enthusiasts and prospective designers from around the world to share their ideas and vision for the future. Michelin Challenge Design also announced the following recognition and awards for the First, Second and Third place winners. Hosted by Michelin Challenge Design at the 2017 North American International Auto Show (NAIAS-Detroit). Includes airfare, hotel accommodations and airport transfers for the sole designer or, in the case of a team design, one team representative. Entry credentials for Press Days and Industry Preview days at NAIAS (January 9-12, 2017). Invitation to attend and recognition at the private Michelin Designer’s Reception, Monday, January 9. Private Portfolio Review with members of the Michelin Challenge Design Jury. Recognition on www.michelinchallengedesign.com and www.cardesignnews.com.